Starring: Noomi Rapace, Michael Nyqvist, Lena Endre, Peter Andersson, Yohan Kylén, Yasmine Garbi, Paolo Roberto, Georgi Staykov, Mikael Spreitz, Per Oscarsson, Hans-Christian Thulin. Second installments of a trilogy have a history of being just the midriff of the story. They tend to lack the essential elements of coherence. No real beginning and no real end is the common problem. This has a few snags like that but it’s still a solid enough follow up. 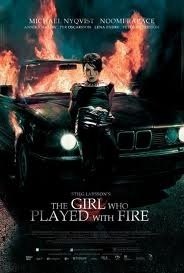 Lisbeth Salander (Noomi Rapace) returns to Sweden, becomes a suspect in three murders and goes on the run. Journalist Mikael Blomkvist (Michael Nyqvist) is sure Lisbeth is innocent, but realises she is being pursued by dangerous criminals who have a connection to her troubled past. Not as gripping as the first, (which is mainly down to the investigation, it doesn’t have the hook the first one had). What it does have in it’s favour though, is the backstory of Lisbeth. We learn a bit more of her motivation and what her history has done to shape her character. Blomkvist doesn’t really contribute very much this time around, mainly just providing support and keeping the flag flying as a decent male character. This second installment is not afforded the same time as the first. It doesn’t develop the characters or story in the same way and as a result it seems rushed, as if director Daniel Alfredson was eager to get onto the third part. Like all middle segments, it’s stutters. Having a change of director can sometimes be a hindrance also, as is, the lack of any proper conclusion. However, it still grips and a major plus is having Lisbeth as the main focus this time, with Noomi Rapace once again a joy to watch, when handing out her form of tough justice on some unsavoury menfolk. It was always going to be a hard task to emulate the first part, but the additional interesting characters add much more to the story in terms of Lisbeth’s history, preventing it from being just another mid-section. This entry was posted on January 29, 2012 at 11:24 pm and is filed under Crime, Foreign Language, Mystery, thriller with tags 2009. You can follow any responses to this entry through the RSS 2.0 feed. You can leave a response, or trackback from your own site. Great review, I agree with most of the points you made but the backstory of Lisbeth was well told.